The program, which started last winter, pairs MOOC-like course videos and assessments with a support system of course assistants who work directly with students. The goal is to create a low-cost master’s degree that is nonetheless “just as rigorous” as the on-campus equivalent—producing graduates who are “just as good,” to quote one of the new program’s cheerleaders, President Obama. The price: less than $7,000 for the three-year program, a small fraction of the cost of the traditional program. By understanding what kinds of students are drawn to the new program, Mr. Goodman and his fellow researchers think they can begin to understand what competitors it might threaten. Bringing down the cost of a professional program is an admirable goal, and this specific success could mean a great deal for the target population of this and other professional, graduate programs. However, the rhetoric surrounding initiatives such as the Udacity/Georgia Tech/AT&T partnership rarely distinguishes between the target population of a professional program and the population at the heart of the crisis in higher education. This entry was posted in Uncategorized and tagged autodidact, crisis, design, for-profit, future, meritocracy, MOOC, policy, President Obama, Udacity, underrepresented on November 6, 2014 by Rolin Moe. Note: I will use this space over the next month to share excerpts from my dissertation The Evolution & Impact of the Massive Open Online Course. The research was a Delphi study bringing together 20 MOOC experts to discuss the MOOC in educational, political, and sociocultural terms (slides from the oral presentation can be seen here). Upon library clearance, the entire document will be available through a Creative Commons license. The following is from Chapter 1, the argument for significance. This excerpt looks at the hype-based MOOC arguments seen in news media, as well as criticisms on the MOOC and its hype. Much [MOOC] fervor comes from the promise of MOOCs as seen from their developers and the mass media. For these individuals and their adherents, MOOCs hold the potential to transform education (Brooks, 2012; Friedman, 2012; Thrun, 2011). Viewed as disruptive technology, a technology that provides an established service to an emerging community of users and in doing so revolutionizes the existing community of users (Bowers & Christensen, 1995), MOOCs can provide elite educational experiences to any citizen of the world with access to an Internet-based computer and a willingness to perform the tasks of the course. These supporters see the MOOC as a global agent for the democratization of education, the opportunity to allow students of all races, ages and backgrounds to take classes from the best professors on Earth (Friedman, 2013b) at relatively little or no economic cost to the user. MOOCs can harness the vast array of the provider’s institutional resources to help transition society from an Industrial Age, goods and services economy to a 21st Century, knowledge-based economy. From this lens, future students will not be encumbered by the mountains of debt currently plaguing college graduates (Parr, 2013), and the MOOC model will allow an ease of lifelong learning, where individuals can enroll in MOOCs as the needs of their careers change (Hill, 2013a). Those critical of the MOOC movement see the potential for transformation as a net negative. The start-up organizations currently organizing and hosting a majority of existing MOOCs have raised tens of millions of dollars from venture capital organizations, and these organizations expect a return on their investment (Veletsianos, 2013a). This privatization of higher education perilously mirrors domestic and international primary education privatization initiatives over the past 30 years, initiatives built around the before-mentioned schools are broken rhetoric, yet those initiatives of the past 30 years have produced at best a negligible improvement in student learning (Mehta, 2013). This line of thinking views the learning potential of the MOOC as secondary to the opportunity it provides private enterprise to create capital in what was heretofore a public service built on government subsidy and non-profit ideals. This entry was posted in Uncategorized and tagged California, democratization, education is broken, Habermas, MOOC, policy, privatization, profit, public good, public sphere, White House on April 2, 2014 by Rolin Moe. This is a response to President Obama’s recent initiative regarding higher education costs, value and affordability, but I will start by talking about Yelp. I don’t like Yelp. I’m not as disestablishmentarian as Jaron Lanier (defining Wisdom of the Crowd as Mob Mentality), but I understand that multiple variables color the aggregation system on a company’s reviews, expertise perhaps one variable, perhaps not. This concerns me. The LA Times discussed Yelp’s business backlash yesterday. Yelp continues to deny that failure to advertise with their website results in the site’s algorithm casting less favor on a business, but business owners are convinced that Yelp runs like the mafia, and see advertising as a necessary evil to cull favor with the site. This entry was posted in Uncategorized and tagged access, affordability, algorithm, big data, datapalooza, GI Bill, government, Higher Education Act, MOOC, NCLB, Open Access, Open Education Resources, outcomes, policy, President Obama, Race to the Top, value, Yelp on August 23, 2013 by Rolin Moe. Bryan Alexander is blogging with frequency again (hooray! ), in his exemplary educator style — pose a topic, add information, perhaps include an informed opinion, and rather than end the blog with a definitive period have it linger for further discussion. He is currently musing on the cost of college, the decline in college enrollments, and the general purpose of college in today’s society. How are the current forces in society, culture and policy shaping the future of the system? This entry was posted in Uncategorized and tagged bootstraps, college, direct outcomes, education, future of education, jobs, knowledge economy, MOOC, policy on May 17, 2013 by Rolin Moe. 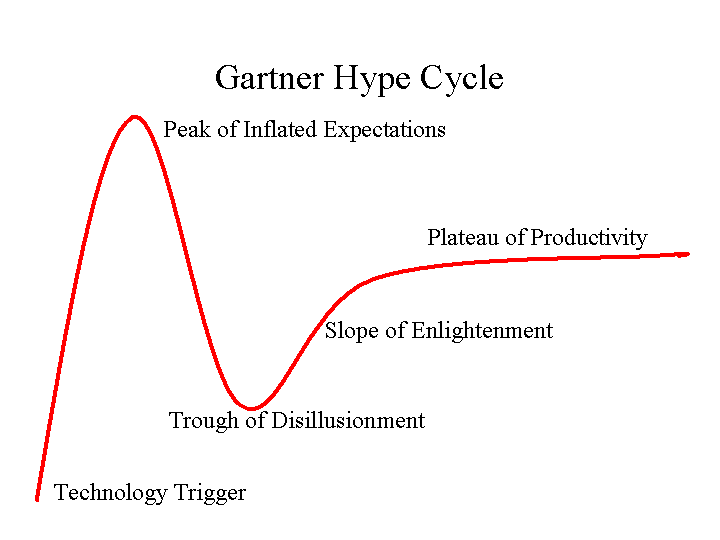 A common theme in early MOOC criticism was a linking of the MOOC to Gartner’s Hype Cycle. Certainly, a lot of hype accompanied the MOOC…more hype than for any EdTech innovation in education history, and perhaps more hype than for any learning model (or even agent of change) in higher education history. Spurred by a media narrative focused on a broken educational system, the MOOC was heralded not only as a means of providing cost-efficient education, but doing it through the best universities and professors in the world, for the entire world, in a way that would break down existing conventions of class and privilege. In short, MOOCs could crumble a bloated ivory tower while providing an education of higher-than-existing quality to individuals from around the world, eradicating student debt all the while. Use of the hype cycle in discussion of MOOCs looked at the learning model as a present artifact that needed attachment to a history. That history could be MIT’s OpenCourseware, Columbia’s Fathom, Yale & Stanford’s AllLearn, the use of television in education (such as Nebraska Educational Telecommunications of the 1960s), the use of radio in education, or even the establishment of correspondence-based schools in the late 19th Century (such as Cornell University’s satellite school of correspondence). None of these innovations proved to be game-changers for higher education; moreover, almost all of the above were deemed failures by the developing institutions. But the MOOC is ahistorical, borne of an intersection of machine learning, computer science and a TED talk by Sal Khan. It cannot be rated entirely on the history of similar distance education ventures, if at all. This entry was posted in Uncategorized and tagged ahistorical, AllLearn, criticism, democracy, Fathom, gartner hype cycle, globalization, media, MOOC, narrative, OpenCourseware, policy, TED on April 16, 2013 by Rolin Moe. The due course of education in America is linked to public policy. This has existed on the state and federal level for over 100 years (well over); however, it is only in the last 30+ that there has been a federal department dedicated to education. Too often it seems that people within their own disciplines ignore societal factors and stressors when debating the merits of their discipline. This happens in education, an enterprise subsidized by governmental monies (to a shrinking degree, however). We cannot debate movements in education without looking at politics. At the same time, politicians and policy hawks need a firm understanding of education if they are going to pitch for a model or debate a movement. Rhetoric and hyperbole only go so far, and ignorance of the theories, pedagogies and history of learning can cause great harm. This entry was posted in Uncategorized and tagged big data, Bloom's Taxonomy. cognitive theory, Cato Institute, constructivism, government, MOOC, Online Education, policy, Politics, social learning theory, Tabbarok, TED, University of Phoenix, xMOOC on November 14, 2012 by Rolin Moe.